As has been the norm, it is an odd time for gaming in the Anjin household. There are several games I could be playing, but no will to dedicate myself to just one. So like a rubber ball, I've been bouncing from one game to the next. 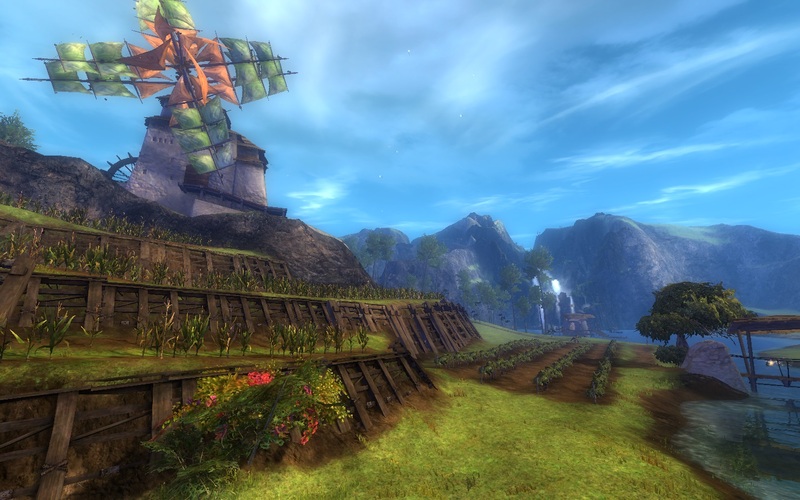 Guild Wars 2 - Gaming time in GW2 has slowed quite a bit since launch. Not from lack of interest, but from too much else to do. When they flipped the switch on discovery from the bank, I spend so much time running through as many possibilities as I could find. But since I'm still only in Kessex Hills, there is quite a bit of adventuring ahead of me. Torchlight 2 - Of all my games, TL2 has occupied me the most. I loved Torchlight in a way that makes me want to spell "love" with way too many O's. TL2 has been everything I love about that game and more. I love the side quests. And the vingettes in the zones. And the one phase beast portal I found was bonkers. I was used to everything being the same from the first game and I'm constantly surprised whenever Runic pulls off something super creative. So good. World of Warcraft - Yes, I played WoW last night. No, I did not cave and buy Mists of Pandaria. I spent the entire night in Nagrand, working on my perma-TBC character. I was surprised to find that the elite mobs had been converted to quest-target mobs instead. Even poor Durn the Hungerer, the saddest of all the gronn. No time for pity when there are blue quest rewards ont he line, though. I don't know when I'll see Pandaria. I doubt I'll roll a panda since I never tried a worgen or goblin either. But I do have a something to spend my time on, even if it is six year old content. So what has kept you occupied? Playing old favorites or discovering something new? In 1996, I somehow found myself in grad school at UCLA. A good friend of mine from high school was also attending, so we ended up rooming together. This guy was a genuine, no questions about it, Nintendo fanboy. To each their own. For instance, I'll be buying the new Xbox as soon as I can, but have never bought a Playstation unless it was used and approaching the end of its life cycle. So that summer between terms, he bought a Ninentdo 64 and what is arguably its best game, Super Mario 64. I was enthralled. Platforming in 3D (from back when that meant something different) was finally down right and I loved it. My favorite level in Super Mario 64 was, without any hesitation, Jolly Roger Bay. The level involves swimming around an underwater stage wherein, at one point, you lift a sunked ship from the ocean floor. The best part of the stage, though, is the music. I remember turning the game on, jumping into the world, and then letting the music play. Even now it brings back memories of a simpler time. If only all game music was so evocative. When we went our separate ways (a story for another day), he took his system and I needed my own. And that's how I ended up with an N64. A few years ago, I found this remix that is ridiculously amazing. Enjoy! Via Polygon (who got it from Videogamer.com), Travis Baldree from Runic Games stated in their recent Reddit AMA that there is no longer a Torchlight MMO on the horizon. And you know what? I'm perfectly okay with that. Travis makes a lot of sense when he says that the landscape has changed. Since they worked on Mythos, they've now delivered two games, both single and multiplayer now, for exceptionally reasonable prices, I'm not sure what more an MMO would bring to the table. And as they say a little bit further down the thread, Runic would like to work on something that's not another Torchlight. While they figure what they want to play, I'm going to dig into TL2 (Thanks, Blue Kae!) and not worry about what else they have up their sleeves for some time. Borderlands 2 - I absolutely adored Borderlands. I normally hate shooters, so I initially very hesitant. 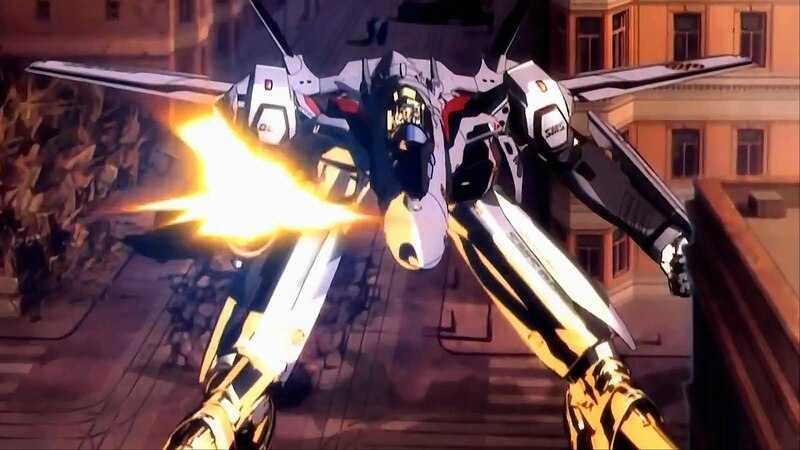 But somewhere between the art style, the humor, and the pure thrill of shooting crazy guns, I found myself playing the game through to completion. So once the second game was announced, I knew I would be ready for more. At least, I will someday. Torchlight 2 - There may be no better Diablo-like ARPG than Torchlight. 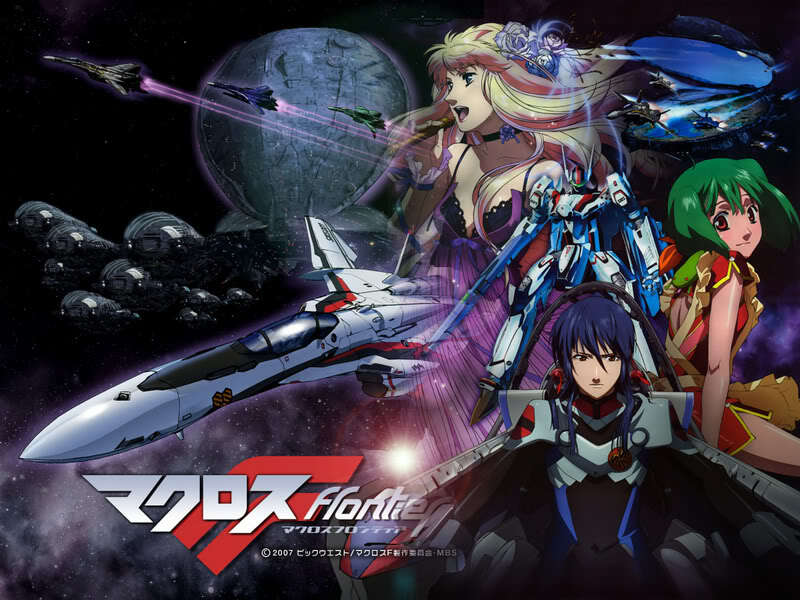 And its definitely in the top 5 Dark Alliance-style ARPGs. As soon as I heard that TL2 was being made, I wanted to play it immediately. But even at twenty dollars, this will have to be more than an impulse buy. Mists Of Panderia - I can't believe that I'm not going to be in WoW at the launch of the new expansion, but that's were my life finds me. I wish that I was more excited about the game, but even having open access for the last year didn't see me playing that much. Lucky for me, Guild Wars 2 is sure to keep me busy for months. But if one or two of these show up under the Christmas tree, I would not be disappointed. If you've followed the blog for a while, you might know that I'm a fan of gamebooks like the classic Fighting Fantasy and Lone Wolf as well as the more recent Fabled Lands and DestinyQuest series. I mean, they are games and books. At the same time! Since I fancy myself a bit of a writer as well, I've also tried to write a gamebook or two in my time. So when I discovered the Windhammer Prize for Short Gamebook Fiction, I knew this was the perfect opportunity to write something, finish it, and put it in front of a bunch of people. So I started to write a 100 section book called Academy of Magic: The First Term to submit for the competition. In 2010. That did not work out so well, so I finally got my act together and submitted for 2012. The voting has opened today. I really should have submitted last year. There are 22 entries this year instead of the prior year's eight. But my main goal was to enter, so I'm glad to have done so. The Windhammer Prize always has a great collection of short gamebooks every year and you should check it out. I'm not asking for you to vote for me. There is likely to be a few books that you enjoy. Do give it a try and have an adventure! Before I go, I wanted to thank Blue Kae and Yeebo for their help with testing. I couldn't have do it without you guys. When I logged in last night, there was just a single heart left in Queensdale. It was located in the middle of the Godslost Swamp, a subzone I'd accidently run into and immediately died in a week ago. My first goal was to track down the skill point, which seemed to be down under the water. That's when I saw the statues. And then the name of the challenge. I was floating in the ruins of the Temple of the Ages! On one side were statues of Dwayna and Kormir (who must have been added some time after the end of Guild Wars). In all honesty, I was a little choked up by the experience. And overlooking the skill challenge, is Grenth, Lord of the Underworld. I could not find the statues for Balthazar, Lyssa, or Melandru. Nor could I kneel in front of the statues. Maybe we don't have favor currently. (Yes, I really tried.) Not that I needed access to the Underworld, since it was popping up all around me. 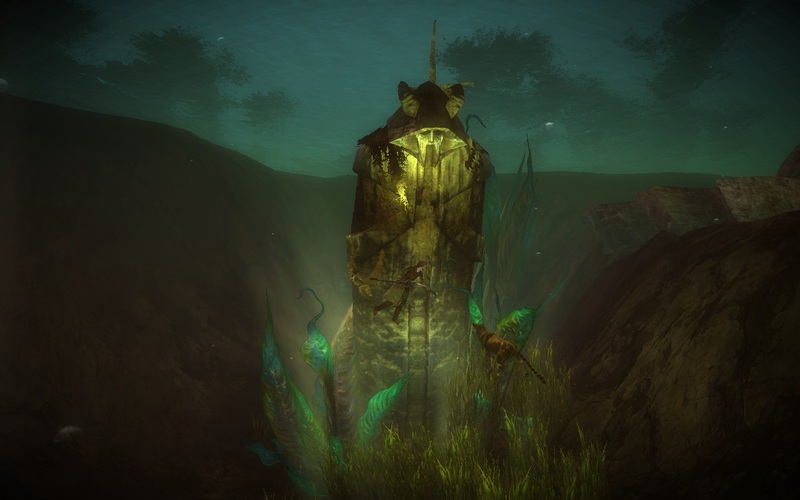 The swamp's heart is completed by killing Underworld creatures and closing portals. I thought it was just going to be a bunch of shades until I was jumped by an aatxe. 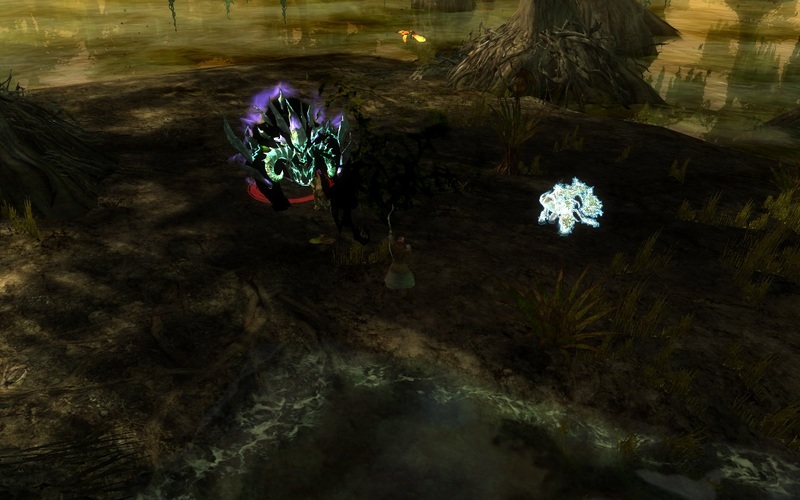 Those things will murder you dead in GW, so I didn't expect to see one out in the open here. That beast just above is actually a Veteran Aatxe, a fact I was not aware of until I turned my HUD back on. What a terrible time to try for a screenshot! The swamp held the last checkpoint, heart, skill challenge, vista, and point of interest for the zone. I reached 100% completion at the portal to Kessex Hills. Hearing about how great the zone completion rewards are, I eagerly kicked the treasure chest only to find a matched set of green pistols (that I cannot use), a large stack of copper ore (I'm a cook/leatherworker), and a few transmutation stones (yay). I'm sure a future alt will be very happy with all of these rewards. Anyway, Kessex Hills, here I come! Players rally to save City of Heroes - Ardwulf has been doing a yeoman's work today, linking and discussing the efforts by players of City of Heroes to save their game. I certainly applaud their efforts, but I won't have more to say unless they are successful. Amazon announces next round of Kindles - The Verge has a huge round up of the Kindle announcements. I'm glad that Amazon isn't giving up the fight. I enjoy my Kindle Fire and use it just about every day. But unless the app situation improves, I don't see much of a reason to upgrade. As much as one enjoys any game (and oh dear, do I love Guild Wars 2), there will always be something you can find that is not quite right. No, I'm not talking about account hacking, overflow servers, and the like. I'm talking about the little things. And these are little, so don't take this as some massive critique of the game. It's just that, should someone at ArenaNet look at this post and decide to fix a few of these, I wouldn't mind at all. Adjustable UI - Currently I'm playing a ranger. (And only a ranger. I want to hold off on alts for as long as possible.) One of the major class features of the ranger is your pet companion. That's cool and all, but the pet bar is completely borked. The icons are stacked on top of one another, so I can't really control it properly. It looks like they are crammed into too small of a space. So I, the intrepid go-getter that I am, looked through the options to find out how to adjust the UI. Only I can't find one. Maybe I'm overlooking it, but I don't think so. Considering how flexible the modification was in Guild Wars, I'm quite surprised that didn't carry over. Crafting from collection - I really love crafting. I love that I can deposit crafting material into the collection from anywhere in the world. I love that I can access my bank and collection from any crafting station. What I don't love is that I have to manually extract items from your collection to your inventory for use with crafting. It's a minor thing, but is the perfect quality of life improvement I would love to see. Underwater preparedness - It wasn't immediate, but it did not take too long for me to find myself underwater, using completely unfamiliar skills. And with a completely inadequate weapon. 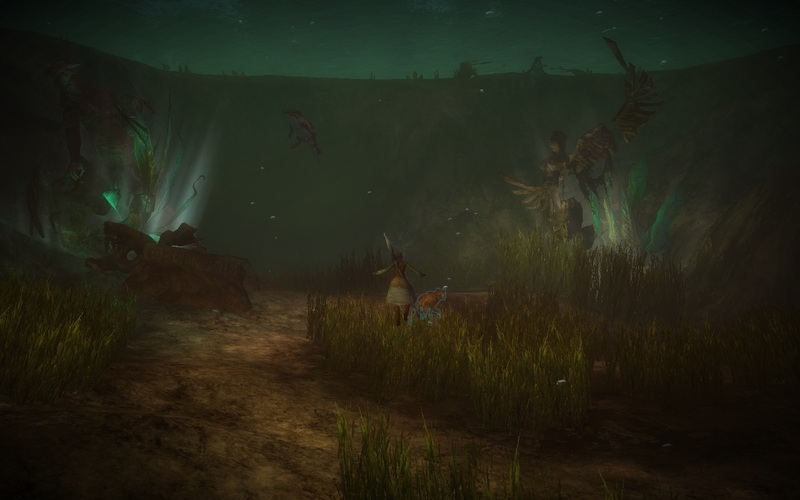 GW2 doesn't really remind you that you need to be upgrading your aquatic weapons alongside your regular weapons lest you fall woefully behind once you hit the water. An extra hint might be helpful. Gem prices are too high - What else can I say. Gem prices are higher than I would ever pay. 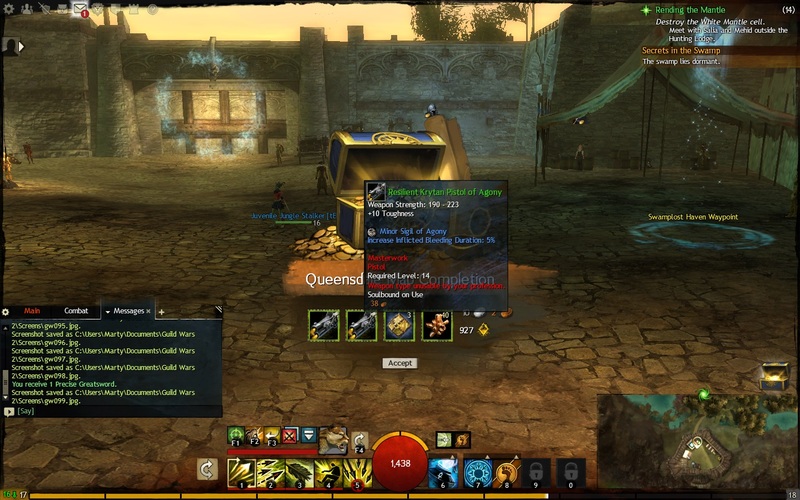 ArenaNet does the thing where it costs one dollar to buy 80 gems just like Microsoft. But then they take it a step further and charge everything based on a hundreds and quarters thereof. It's a great way to obscure how much things really cost. (Everything on Xbox is in multiples of eighty, so the math there is still easy.) But anyone with a calculator can see that prices are too high. I'm hoping that ANet follows SOE's lead and Gem discounts. Since the digital deluxe in available for gems, I don't really see that happening. But until that time, I don't have any extra money to through at what is, in all honesty, a deserving game. 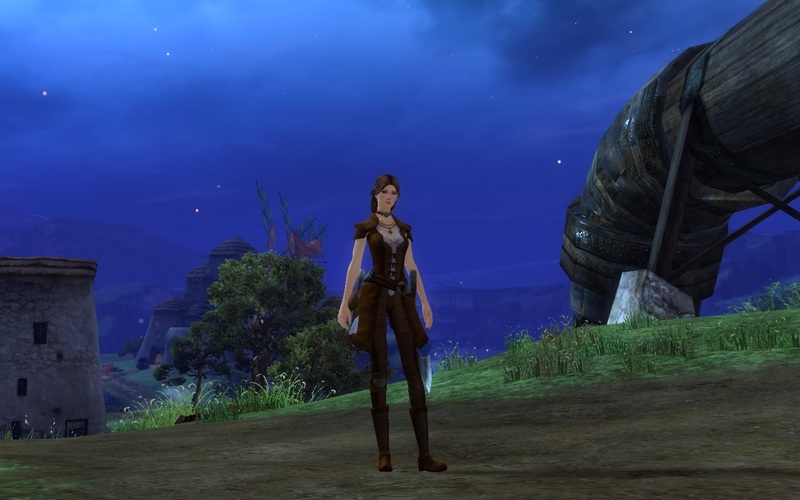 My chores were minimal Thursday night (and I really needed a break since I wasn't feeling especially great about myself), so I sunk into Guild Wars 2 for a time. I'd been stuck in Divinity's Reach for long enough, so I felt the call of the wilderness. And all of those little icons in said wilderness. One thing that I didn't expect, even though I fully should have because I did Guild Wars quite a lot and they did the same thing there, was all of the optional paths, hidden nooks, and landscape just for the sake of having something cool to see. On the west edge of Queensdale, there is a long ravine that leads between the northern and southern halves of the back, patroled by several ettins. There is not reason for it to be there except that it's cool. So of course I fought my way up and back, killing and gathering all the while. And I swam to a waterfall, I ran into Kessex Hills, and I got killed in a swamp that was too high of a level for me. Just for the fun of it. By that time I had leveled enough to return to my personal story. Of course the clandestine meeting (right in the center of Divinity's Reach!) was an extended ambush. Freaking White Mantle again! Hilarious that they've become cultists in the intervening centuries. It's a good thing they came in waves instead of all at once or I never would have survived. As an aside: I really miss the Mursaat. 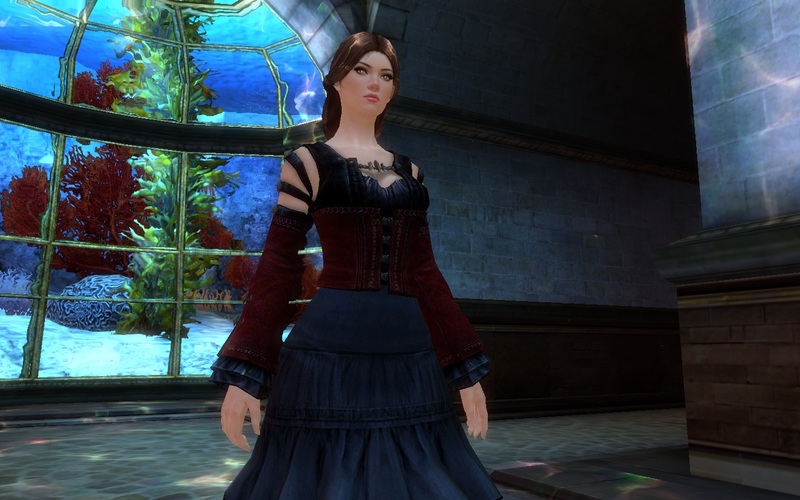 I hope GW2 delves into the history of the world more. Between the Mursaat, the Seers, and the Forsaken, there have some neat little bits of lore. 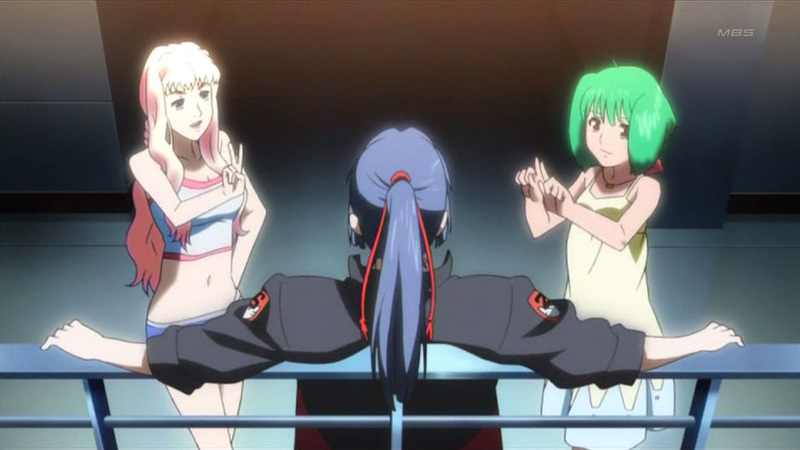 The next step in the story was rated three levels higher, so it was back to adverturing again. I fought bunch of centaurs, skritt, a server reset, and escorted a flock of pygmy moas to find my way to Beetletun. I can't believe how huge this world feels. And I'm just in the starter zone. I love running around and just running into stuff. Unfortunately I'm so used to other games that I forget that downleveling means I have to treat every enemy seriously. And then it was two o'clock in the morning. Via Polygon, word comes that NCSoft's City Of Heroes, the first superhero MMO, is targeted for closure. In some ways, it is not surprising. COH was old school in the vein of Everquest. It has modernized much over time. But at its core, it is a game that reacted to the earlier generation of MMOs, unable to take clues from World of Warcraft. That's going to be plus is some people's minds, but it undoubtably limits the scope of people who would be interested in the game. Of course, I speak from a perspective of someone who hasn't played the game in several years. I was never able to fit into the game when I did try. Then once Champions Online was released, there was no reason for me to ever go back. It's sad to see any game close, especially one with such a towering heritage in the MMO genre. I hope there is a hacker out there perfecting their private server so that we don't loose the game to oblivion. I played for all of a half hour last night, so I'm making this a Random Shots instead of a Played Lately post. 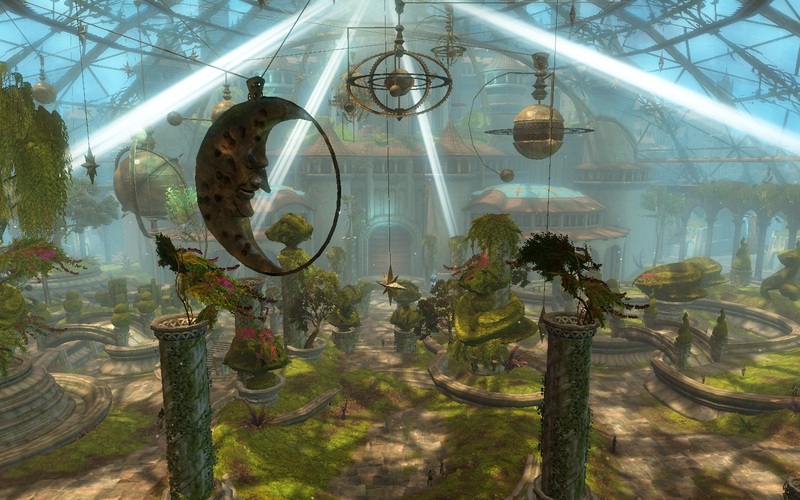 But it's still going to be all about Guild Wars 2. Things aren't that different around here. When I woke up yesterday, I saw that Rowan wants to quit blogging. He shouldn't, and most likely won't, but I can't blame him for feeling that way. There is nothing like a new MMO to bring out the worst in the blogging community. It's Haters versus Fanboys in the streets since GW2 came out. If you haven't already, though most of you have looking at the comments, go show the guy some love. I was in game long enough to make my way to Claypool. Once there, I engaged in a shield training exercise to complete the town's heart. And I did a little more cooking. I'm thinking of buying one of every common ingredient just to have more discovery options. That's going to get expensive, though. I can't say I wasn't warned. Tobold makes a great point about the technical problems with the game. They seem to only be affecting people who actually like to play with other people. Solo players like myself have been largely unaffected. I feel kind of guilty about that. My antisocial tendencies are being rewarded. Knowing ANet, it won't last forever. I just changed my password to a crazy long phrase. Something I can remember, but at least it is unique and should give the dictionary hackers fits. Be safe out there. I did not have much time to play, but I couldn't help but explore more of Queensdale last night. As I neared an incomplete heart, I saw an icon that I didn't recognize. It turned out to be Assistant Chef Victor looking for skale eggs. As soon as I talked to him, an event began and people started to gather. It was it was amusing to me how fast other players were drawn to a new event. And when we finished, he sold me a recipe for Eggs Beetletun. A food recipe with bonus to Magic Find? I've never seen such a thing in an MMO. Amazing. One thing that I appreciate about the game so far, as I did with Guild Wars, is that the game respects your time. This is not a unique thought; it came up on the Gamers With Jobs podcast as well. I love that crafting recipes multiple times accelerates the completion rate. I love that I can teleport just about everywhere. I love that I can access my bank right from the crafting station. Just a quick hit today. Have a great time in game. Launch issues - Just about every game has them. Ardwulf gave a personal view of how it affected him. I did not have any issues outside of an instance change disconnection until I ran into an extended loading screen last night. I count myself extremely fortunate considering what some people have been through. Overflow servers - I've also run into constant overflow servers. Every time I change zones, I get a popup telling me I'm in overflow. Then a couple minutes later they tell me the regular zone is ready. It is completely silly. But since I've only been playing solo, it's not as infuriating as to those who are playing with friends. Also, can someone tell me why the overflow server is always more crowded than the main server? Personal story - I've been enjoying the personal story line quite a bit. I just hit a quest a couple levels above me, so I have to go out and level again. It's funny just how much it feels like a Guild Wars story. I guess I shouldn't have been surprised since it's still ANet, but I was. Vanity guild - Just as in the first game, I made a new guild as soon as I could. So The Brotherhood Of Stone is currently a one person guild on Fort Aspenwood. It is entirely a vanity guild made to support me, myself, and I. However, if you want to wear the [tBoS] tag, just let me know. I'm Anjin.5086. Naming conventions - Considering how many things carry over from the old game, I'm surprised that the convention of taking a first name and a surname did not continue. I couldn't give it up because that is part of the Guild Wars experience for me. But it is alien to me to see so many people falling back into the bog standard MMO mononym. Embrace your creativity! That Reddit thread - Speaking of naming conventions, I'm super glad to seen that ANet is taking their enforcement responsibilities seriously and stepping on any bit of naming or chat idiocy that gets reports. So if you see something out of line, report it! The other thing this thread highlighted is the amount of account theft already in progress. I turned off chat as soon as I started the game, so I can't tell you if gold spam is a problem. Even with heavy policing, ArenaNet has to look into two factor authentication as soon as possible. I have not played very much since that first night. I've been working on the personal story since a lot of it is centered on Divinity Reach at the moment. However I'm itching to get back into the world and adventure again. I love being overwhelmed with so much to do! 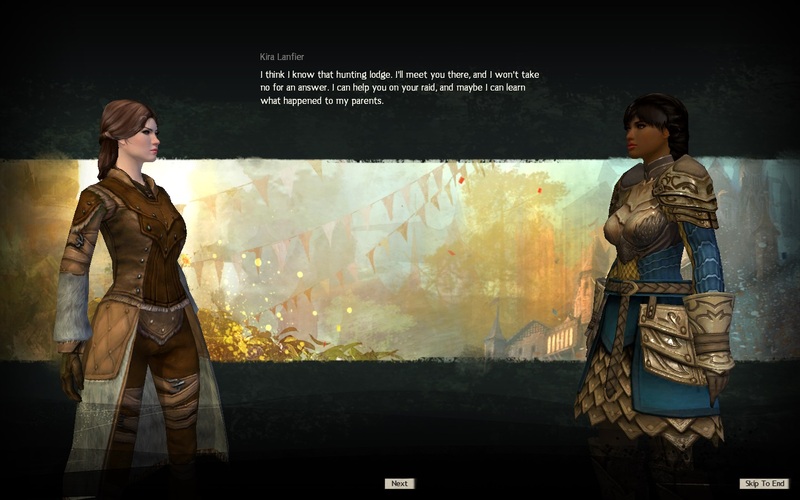 For some reason, everything leading up to Guild Wars 2 gave me the impression that I would not enjoy the game. Even playing in the beta test left me cold. I don't know if it was the level of hype or personal issues, but I was not looking forward to the game launching, except that maybe people would finally shut up about it. Oh, how wrong was I? While I've read any number of blog posts for people trying to decide with races and classes to play. For me, it was no choice at all. As in Guild Wars, I would be playing a human ranger. I knew my first character would be a descendant of my GW character. And I really have wanted to see what happened to the humans after I saved the world several times, even killing a god in the process. Evidently, that kind of thing doesn't last for long. One day I'll probably try a sylvari or norn, but I'll stick with humanity for now. My short time playing the beta did not prepare me for exactly how much fun it would be exploring this world. Since I'm unconstrained by the quest chain, I feel to say "I'd like to see what is over here" and just take off. And that's an entirely valid way to play! 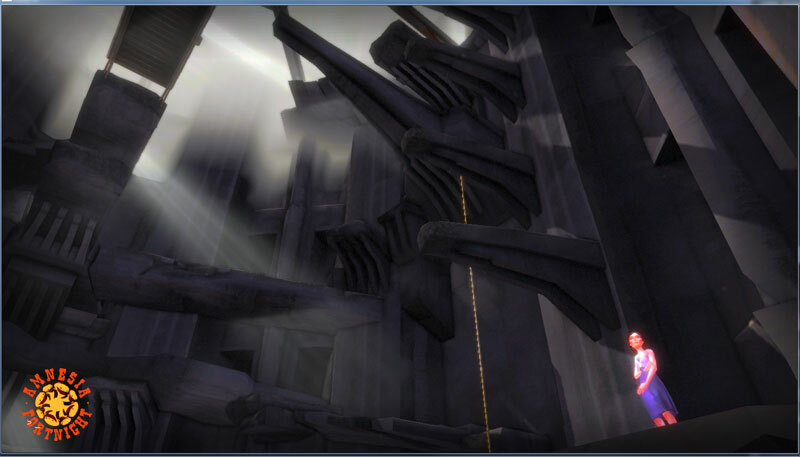 I found myself in an underground complex in the middle of Queensdale for which I was a little underleveled. But there was an event going on that I could take on and there were harvesting nodes to clean out. There was no reason for me to be there, but there was every reason to look around. I'm rather stunned how great it feels to be unshackled from the WoW model. It was great seeing crowds of people everywhere. And it was even better that I enjoyed having them around. Since I am an inveterate soloer, I usually hate having people around killing my mobs and clicking my items. But since whatever they are doing can only help me during events and there is plenty to do while filling hearts (Is there an official term for that? Filling hearts sounds so dumb. ), I've never been angry to have other people around me. Of course, it would stupid to base my opinion on the crowds in the newbie zone during these early days. Hopefully the dynamic side of the events work just as well when the population thins out. For all the time I spent adventuring, I spent equally as much time exploring Divinity's Reach. That city is amazing. It seems like everything that WAR's cities wanted to be, but couldn't pull off. I loved wandering throughout that vast urban area and taking in the sights. There is so much to see. And there is so much potential to fill out the city. I spent a few hours just running around and looking at stuff. And, of course, seeking out all of the vista spots. What a great concept! I just about wore out my Print Screen key this weekend. I'm sure that I'm not the only one posting that exact screenshot today. So that's where I am now. My play time was limited due to real like circumstances. 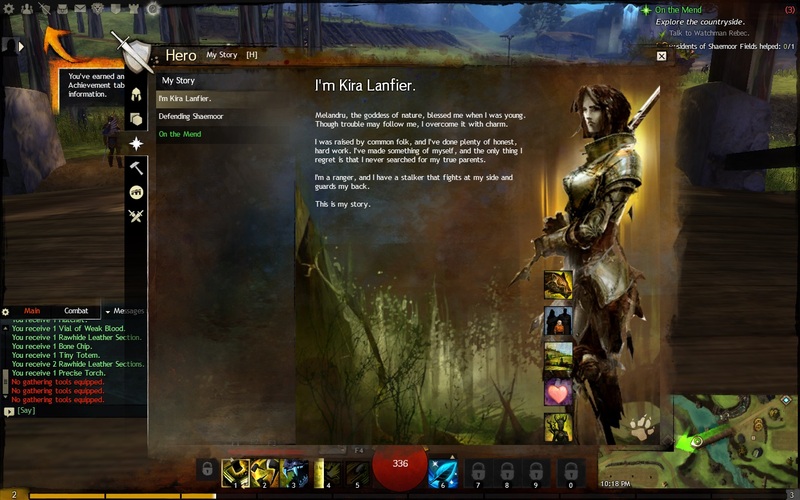 But you can bet that I will be in Guild Wars 2 for a long time to come. I could not be happier to be so wrong about a game. Vagabond is one of my favorite new voices to come out of the NBI (Go check him out.) So when he recently asked the question "Why should I care about Copernicus?" I had to take notice. I'm not aware of anyone else who writes about the game with any frequency, I figure I should actually answer. You probably shouldn't. There is no game coming at the end of this hype cycle. Vagabond points out that with new games coming out (like City of Steam), there is no reason to follow a game that won't ever exist. And he is right. But I'm not in this for entirely rational reasons. Archeology - Because the game is destined to never come out, I enjoy digging up whatever data I can. Like an archeologist piecing together the shards of a shattered urn, I am gathering the pieces of a shattered game. What I end up with will only be a pale reflection of the original, but I enjoy learning as much as I can. Contrariness - There is another part of me that is holding onto it out of dogged stubborness. This subject fascinates me and I'll be damned if I'm not going to write about just because I happen to be the only one who cares. 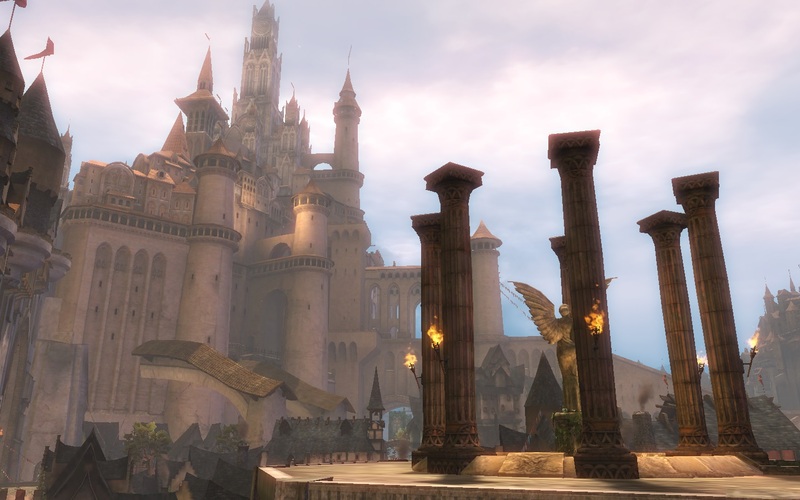 I blogged about Champions Online long after is was no longer fashionable to do so. As was said many times during NBI, I am blogging for myself. If just one other person is interested in the subject, if somewhere down the line they can use this blog as a resource to find out about the game, that would be cool. But mostly I'm leaving these notes because I want to record it for myself. Mourning - Finally, there is a part of me that is profoundly sad that the game imploded so spectacularly. People poured their energy, their dreams, and their lives into the project and there is nothing to show for it. I'm not sad because I won't be able to play the game, I'm sad because they won't get to see their game played. So these posts become an extended vigil for an idea that died. There you go. I promise to always include the name Copernicus in any posts about the game. So feel free to skip them when they come across your RSS reader. Or maybe, if you are curious, peek inside because maybe I'll have found something pretty cool. By way of Patrick Klepek of Giant Bomb, Youtube user "stduquette" has uploaded three video fly-throughs from Project Copernicus. I can't embed them here, so you should head over to Youtube and watch them yourself. The way they are named, labeled (City Crew) and dated, these look like presentation videos to show off how the team working on Amalur's cities is progressing. There are two videos showing off the gothic city of Jottunhessen, dated September 2011 and December 2011, and one for Valiance (the city in front of the dam) dated May 2012. The more this stuff comes out, the more I'm bummed out that I'll never get to explore that world for myself. 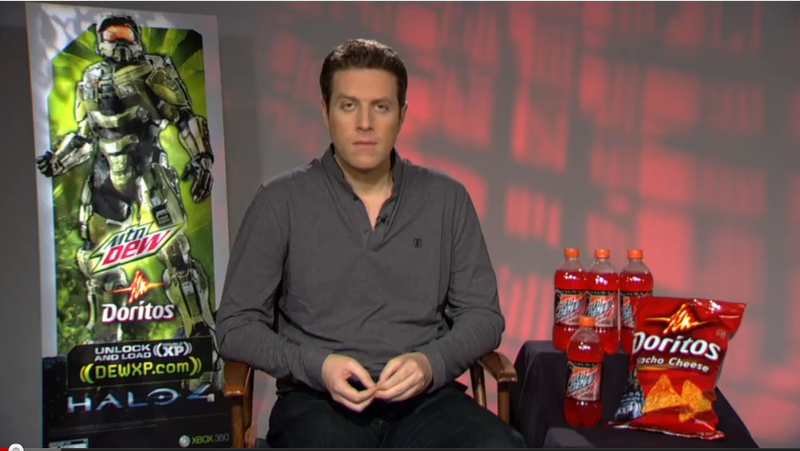 [...] and I've actually played some Champions Online and really enjoyed that as well. I haven't played CO since the f2p conversion, and boy has it changed since then. It's good, it's fun and I think I am going to be playing more of it again! It has been a long time since I played CO. More than a year? Yikes. So I updated the client and jumped into the game. Jaye was right! I can't believe how much has changed. I almost didn't recognize it. They changed the title screen, the loading screen, messed with the UI, and threw a huge intro for the latest patch up on the screen. It was overwhelming, but everything looked great. As I am want to do, I immediately backed out to the title screen and rolled a new character. Aside: I've always heard that people in superhero games tend to accumulate alts like crazy. Since I like to devote my time to one main character, I tend not to branch out into alts unless I've been in a game for a long, long time (e.g. Guild Wars, World of Warcraft). I have eight different superheroes of various levels now. I may need help. I was amused to find that Cryptic has streamlined the tutorial (which I never ever skip). They blocked off a section of zone where a couple of frivolous quests once appeared. And they removed Kinetik from his trap. It was much quicker to move through the zone and get to back to Millennium City. And that's when I discovered how much they have updated Renaissance Center and Westside (again!). It's crazy to me that I've been away from the game for so long that I have trouble recognizing it. Everything is still familiar; it's still hot keys and powers and costumes. But the details have changed enough that it feels like discovering a new game. That has been a very pleasant surprise. The World of Warcraft: Mists of Pandaria trailer is out. You've probably watched it, but I really like embedding videos now. Opinions are mixed, as I've come to expect from the internet. I was pretty happy with how it turned out. I like having actually Horde and Alliance characters in the video again. I love that it evokes a sense of mystery about the world. And I love that it returns to the whimsy that has always been a hallmark of the game. If the trailer tells me anything, it's "This is going to be fun." World of Warcraft - The first is still the best. It introduced the world, the characters, and the conflict cleanly and clearly. Mists of Pandaria - See above. It feels like a natural continuation of the first two trailers. Cataclysm - Like the WotLK trailer, this is more about telling a story than introducing a world. But it pretty cool seeing Azeroth messed up like that. Wrath of the Lich King - Definitely the worst of the trailers. It is beautiful from a technical perspective. But it takes the focus away from the characters and the world and places instead on the big Blizzard story instead. No thank you. What did you think of the new trailer? Which one was your favorite? So what's the story? Gearbox gave a studio tour to Eurogamer (and other media outlets, presumably) to talk about Borderlands 2, and the pre-order bonus class, the Mechromancer. 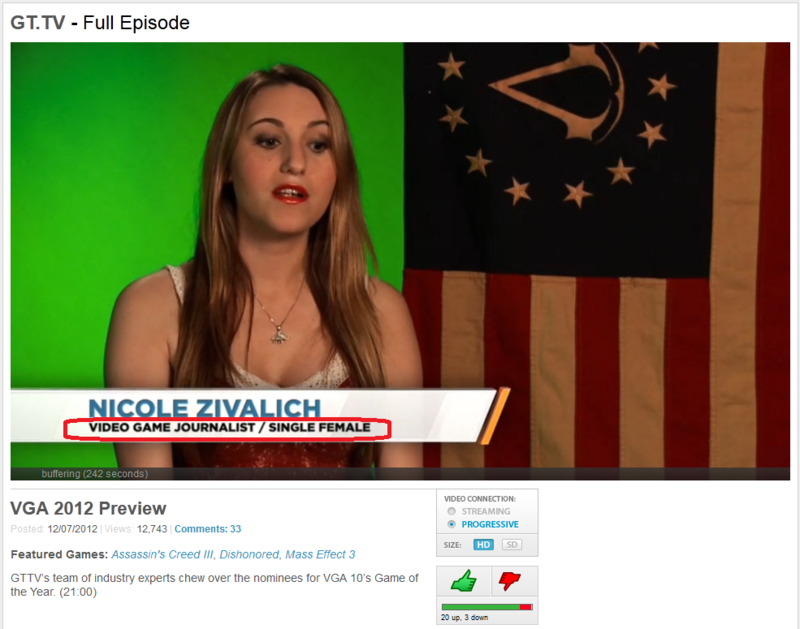 During the interview, designer John Hemingway referred to the character's Best Friends Forever skill tree as "girlfriend mode". Since the article broke, Gearbox president Randy Pitchford went on the attack, but that didn't do much more than fan the flames. I am a little reticent to blast this man with the full force of the Internet Hate Machine for a comment made out of turn. I really wish there was more context for the two word quoted that freaked everyone out. But considering that author Wesley Yin-Poole has always come across as a straight shooter, I doubt that illumination would paint the phrase in any better light. Because even if he didn't mean it a deragatory way, that's where he ended up at the end of the day. Folks, we can't use language that implies an entire gender (or race, or sexual orientation, et al.) is somehow lesser just because of how they are born. It is demeaning to them and it is demeaning to us because we perpetuate this stupidity. I would love if my wife or daughter saw me playing this and wanted to join in. How belittled would they feel if I put the game on "girlfriend mode" for them. Sure, that's not what they call it in the game, but it's out there now. They can't take it back. I would much rather be playing Borderlands 2 than writing about it. I've actually stopped reading anything because I want to go in fresh. This isn't going to keep me from buying and playing the game. But I really hope that Gearbox owns up, says it will do better, and really does so. P.S. If you are curious about how to stamp out sexism, take a look over here. Someone is doing it right. That's right, Trion is announcing that there will be an announcement of the new Mage soul for their upcoming expansion. The probability of three more announcements and announcements of said announcements is very high. Thanks for the invite, Trion. But how about you just launch the expansion? That's all anyone cares about anyway. From Massively, we receive notice that the free-to-play rollout for Vanguard: Saga of Heroes has slipped out a week early. So if you were planning to check out the game once those pesky subscription fees went away, now it your chance. I tried out Vanguard a couple of years back during a free trial, but it didn't really hook me at the time. I was never, ever, going to pay money just to give it a second chance. The move to free-to-play is exactly what I've been waiting for, ever since John Smedley teased it a couple of years back. Are you going to try out Vanguard? Because really, what else are you going to do until Guild Wars 2 comes out? MMO Gamer Chick had an interesting post up Wednesday that struck a nerve with me. In it, she reveals that she likely won't continue to play Star Wars: The Old Republic for much longer now that it is going free to play. I also prefer the subscription model, and I think for a similar reason. The pressure of a monthly subscription forces me to get the best use out of my gaming time. If I pay for a month and then fritter it away, I've wasted $15 dollars for no good reason. There is freedom in knowing that I have access to the entire game for my fifteen dollars, even if it is only for a month. But as soon as the game goes free-to-play, that pressure goes away. There is no incentive to use my time wisely if I'm not spending money, so I don't play at all. Oddly enough, I discovered something similar with my lifetime subscription to Champions Online. Once I got the value out the purchase, I drifted right away from the game. I don't really need to bring out my old prejudices again the Free To Play model. Especially when Wilhelm is already doing such a great job throwing up the caution flag. But that's always going to be in the back of my mind as well. I'll have more thoughts about the WoW Annual Pass in a couple months, so stay tuned. But until then, I'll stick with my subscriptions, thank you very much.